At the October 2018 Social night on Saturday 20th October 2018 from 7pm we will have a normal open social night where anyone can drop by and we will have a theme of Electric Vehicles. We plan on having a few Electric Vehicle owners attend, and you can have a look around the cars, along with seeing them charge at TOG’s own electric vehicle charge point. If you are interested in Electric Vehicles or own one, this will give a non formal chance to chat to owners along with getting a tour of the TOG hackerspace, and seeing all TOG has to offer including laser cutters, 3D printers, a full workshop and more. The event and all social nights are free of charge so drop by. 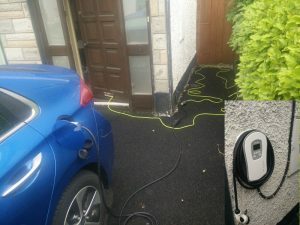 For those with Electric Vehicles we have a type 2 tethered charger and a 3 pin household style outdoor socket, but charging will be only for those that really need it. If you have specific questions you can contact us through the website, but feel free to just drop by at one of our themed open nights. This was written by zg3409. Posted on Sunday, October 7, 2018, at 8:13 pm. Filed under Calendar Event, Open evening, Uncategorized. Bookmark the permalink. Follow comments here with the RSS feed. Post a comment or leave a trackback.